I recently spent the afternoon in Crandon WI. 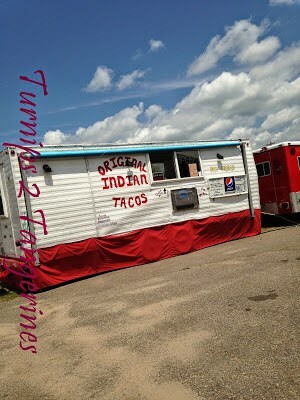 While there, I took a picture of this Food Stand that served Original Indian Tacos. Unfortunately it was closed but it did get me thinking…what the heck is an Indian Taco? When I got home, I googled “Indian Taco” and I was not only thrilled with what I found but so glad I did!! What I love about having a food blog is I have learned so many things about food and food culture, The Indian Taco is a perfect example. While on my field trips, I have learned so many things about the State of Wisconsin and the fascinating people who call Wisconsin their home. Then…I get to come home and make these “new” to me “food finds” and the best part is, I get to eat them. The next time your looking for something to do, get into your car and take a drive down the back roads of your state and see what delicious “food finds” you can find! Yá ‘ át ‘ ééh! Welcome! 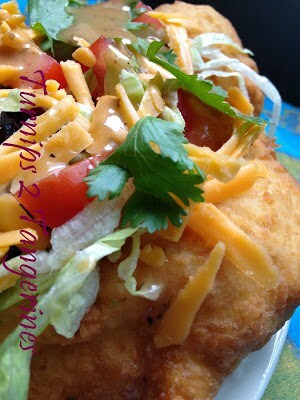 Indian Tacos, sometimes known as Navajo Tacos, are made using fry bread instead of tortillas. Frybread links generation with generation and also connects the present to the painful past of Native American History. 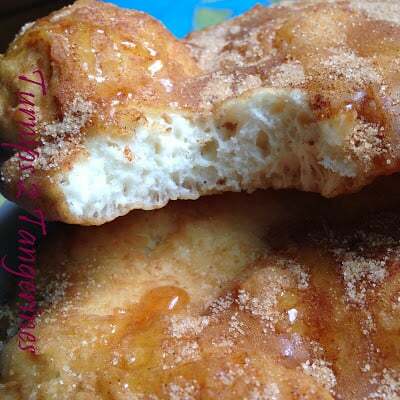 Frybread, also spelled Fry Bread, is a flat, soft dough fried or deep-fried in oil, shortening or lard. 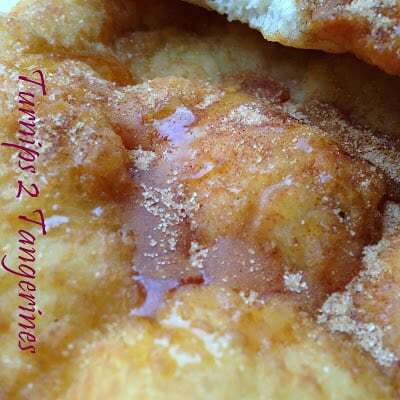 Frybread can be eaten alone with various toppings such as: honey, jam, butter or syrup. 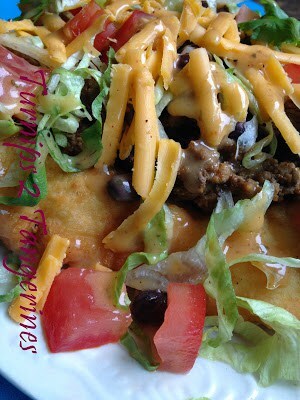 Frybread can also be made into tacos. This was the first time I have ever made fry bread or eaten fry bread. 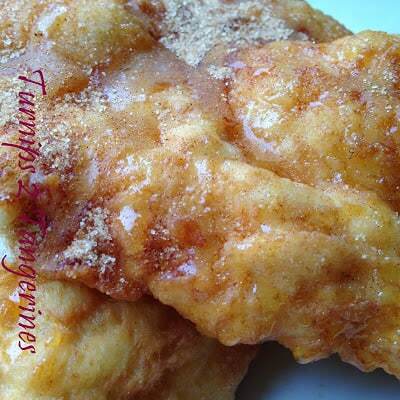 First of all, fry bread is extremely easy to make. I mean super easy to make. Second, fry bread is absolutely delicious. 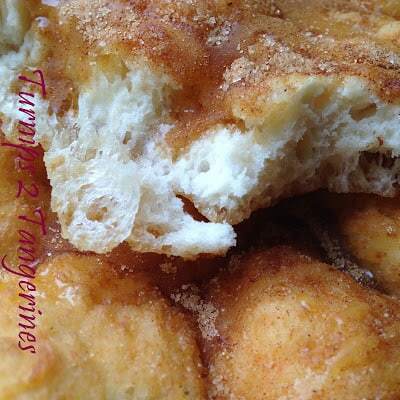 Super, duper delicious…right up there with doughnut delicious. I made Indian Tacos for dinner and my hubby and I devoured them. 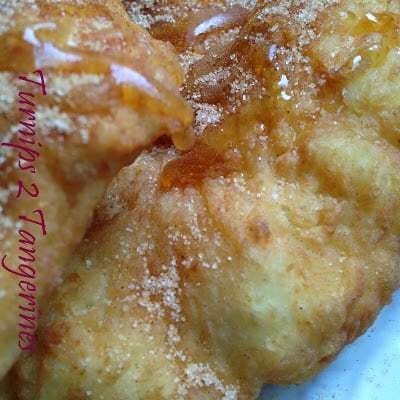 For breakfast the next day, I made fry bread and served the frybread warm with honey and a mixture of cinnamon and sugar. Well, what can I say…..I am talkin’ delicious. Navajo Frybread originated 150 years ago, when the United States forced Indians living in Arizona to make the 300 mile journey known as the “Long Walk.” The Navajo were relocated to New Mexico, onto land that couldn’t easily support their traditional staples of beans and vegetables. Indian fry bread is a tradition to the Navajo, and comes with a story of great pain and suffering. Even though the tradition of making fry bread is common among many Southwestern Tribes, it’s the Navajo who developed the recipe. The Navajo dinetah or homeland was bordered by the four sacred mountains, from Northeastern Arizona, Western New Mexico and North into Utah and Colorado. Around 1846, large numbers of pioneers moved into the area and the cavalry came with them. The Long Walk of the Navajo also called the Long Walk to Bosque Redondo, was an Indian removal effort by the US Government in 1863 and 1864. By the 1860’s, more settlers pushed westward and they met with fierce resistance from the Apache and Navajo, who fought to maintain control of the land. In September 1863, Kit Carson was dispatched into Navajo land to retrieve a surrender. When no Navajo came to meet him, he ordered the burning of the land. Attempts were made to starve out the Navajo and many were captured and taken to Bosque Redondo near Fort Sumner.Hundreds starved on the 300 mile walk and more would die in the crowded camps. The government supplies of lard, flour, salt, sugar, baking powder or yeast and powdered milk were often rancid. Fry bread came from these few foods provided during the 4 years of captivity. Since that time, it has become the traditional food at most Pow Wows of numerous tribes. To some, Indian Fry Bread is a sacred tradition. It is to be consumed by the people until the earth has again become purified. Fry Bread is the official bread of South Dakota. Chester Nez, last of the original Navajo Code Talkers, died in June of 2014. In the United States history, the story of the treatment of Native Americans is tragic. Settlers took their land and misunderstood their customs, but during World War II the US Government needed help from the Navajo people. Although they had suffered at the very hands of the US Government, the Navajo People proudly answered the call to duty. Most codes during war time are often broken. Yet the Navajo Code Talkers confused the enemy by talking in their native tongue and in codes. Because of these reasons, the Navajo Codes were never broken. Catholic missionaries who were sent to help the Native American people, moved off their homeland and relocated to reservations, discouraged the Native American people from speaking in their native tongue. Whisk the flour, baking powder and salt. Combine milk and water in a separate cup. Add wet ingredients to flour mixture, and stir with a fork to mix well. You will have a soft dough. Flour your counter top with the remaining 1/4 cup flour and coat your hands, too. Shape the dough into a cylinder and cut into 4 pieces. Pat each piece out into a circle about 1/3″ thick and 6″ across. Heat the oil to 350 degrees and fry bread one at a time for about 2 minutes on each side. Drain upright. Serve topped with meat, beans, cheese and other toppings of your choice or serve with sweet toppings of your choice. Kitchen Tip What is a Roux? I found my information at these wonderful websites. Stop by and read more about this piece of American History. **Please Note: I try very hard to research all information possible when writing my posts on food, food culture and the places I visit while on my Field Trips. I also try to give links and/or references to all resources that I use and obtain permissions whenever possible. You can contact me at: lane.lavender2@gmail.com with any concerns you may have. Such a great post, Lynn. I love reading the stories behind the food. Navajo Tacos are something I've always wanted to try, but they seemed intimidating to me. They sure look good! 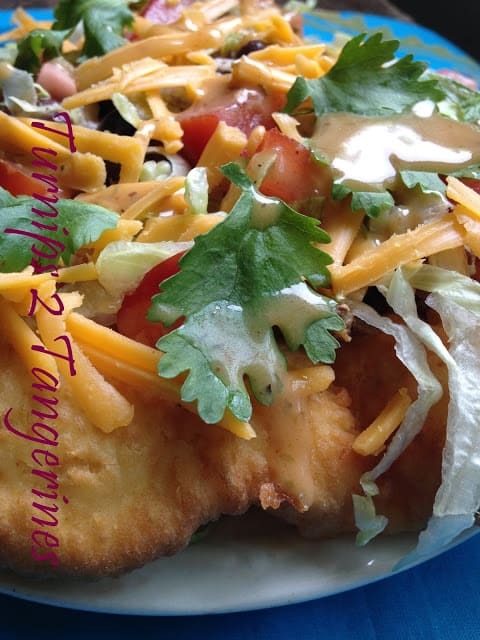 What a very special Taco, we will just love your Navajo Frybread Indian Taco. Thanks for sharing with Full Plate Thursday, I always look forward to your visits! Oh, looks delicious! I could eat this bread even without topping.